there are several reasons why i’ve been trying to get into the shin megami tensei series for awhile. apparently in its native japan it’s a highly regarded series, ranking in popularity right behind the huge dragon quest and the also very popular final fantasy series (well, according to the source from c. 2000 that wikipedia cites anyway), and it celebrated its 25th anniversary in 2012, the same year as the final fantasy series. i suppose the SMT series (aka megaten) had first come to my attention via the persona series, one of its many spin-off series and one of the first of the series to be brought to the US. one of the main features of the persona games (starting with #3) is building relationships between your team members in order to gain advantages in battle, and as that’s one of the things i love about the fire emblem series i was interested in finding out more. on top of that, last january nintendo announced a crossover game between the SMT and fire emblem series, which renewed my interest, although in this case the crossover seems to be with the mainline SMT series as opposed to its spin-off series persona. and on top of that, nintendo had a promotion to encourage fans of fire emblem to try out SMT and vice versa by giving a sizable eshop credit to motivate people who bought one to buy the other. all well and good, but for a completist like me it took a bit of work to sift through the series’ long history, replete with spin-offs with extremely similar-sounding names, and to decide where to start. the series actually began on the famicom (i.e. japanese NES) with a pair of titles, released in 1987 and 1990, the first of which was called digital devil story: megami tensei (“megami tensei” apparently means “rebirth of the goddess”). those games include all the trademarks of the general series, namely 1st-person dungeon exploration, typical RPG battles, a cyberpunk setting, assuming the role of a male protagonist who is accompanied by a female magic wielder, and its most noteworthy feature, negotiating with demons to either recruit them, receive items, and/or avoid having to fight them. the demons are drawn from all of the world’s mythologies and range from angels to devils to egyptian, greek, and roman gods to pixies and fairies and elves. the other main characteristic of the series is fusing demons together to create stronger ones. those two games have never been released in the US, and even amongst the online community they apparently weren’t interesting enough for fans to want to translate them into english. on nintendo’s next console (called the super famicom in japan and the super nintendo everywhere else) the series really picked up with three releases: shin megami tensei, shin megami tensei II, and shin megami tensei if…. the added “shin” apparently translates to “true”, so the full translation of shin megami tensei is something like “true goddess reincarnation”. the first two of these games have been translated into english by fans and patches can be found online, and very recently an official english-language version of the first of these games was published for iOS for $8. the games have a completely different storyline than the famicom titles, but they basically include, refine, and expand all the elements of their parent series. the games seem to generally stick to post-apocalyptic settings, and SMT is also notable for introducing the concepts of player choice: throughout the game you’ll choose to align to the law or chaos sides or remain neutral, and your alignment apparently affects the ending. the game makes a notable distinction by making the conflict be between law (i.e. order) vs. chaos rather than the usual light vs. dark in order to point up that neither order nor chaos is “better”, but that each leads to very different consequences. 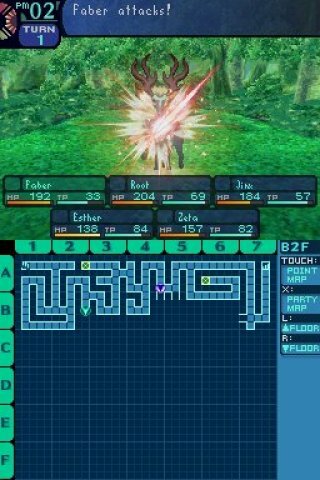 unsurprisingly, the mainline series stayed the closest to its roots, although SMTIII, released in 2003, established a 3rd-person perspective that would be reused in SMTIV. 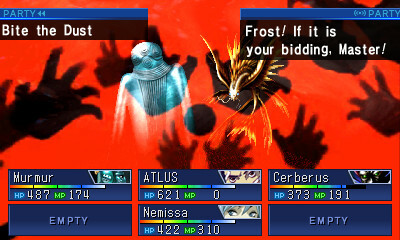 the digital devil saga series, begun in 2004, was a brand-new series that had you and your party transforming into demons rather than summoning them. the persona series reinvented itself in 2006 in the form of persona 3 which, as i mentioned, put building relationships with your teammates front and center, and completely got rid of demon negotiation altogether (although fusion is still an element of the game). that same year the devil summoner series also reinvented itself in the form of devil summoner: raidou kuzunoha vs. the soulless army, a real-time action RPG which had you recruiting demons by battling them rather than by negotiation (although, again, summoning demons and fusing them is still a major part of the game). lastly, the devil survivor series, begun in 2009, is the latest spin-off, and features typical grid-based tactical RPG gameplay but with demons as part of your party. one interesting thing to note is that although SMT has an array of spin-off “series”, the number of entries in each series is pretty much limited to just two in every case, so it remains to be seen how each of those series will continue within the niche they’ve already established, or if they’ll change directions as they have in the past. there have also been an assortment of games outside of these “main” spin-off series, including japan-only mobile games, an MMORPG, a fighting game, and an upcoming rhythm game, as well as some games specifically targeted to kids and given a more pokemon-like spin (a pair of which, demikids: light version/dark version, were released in the US for GBA). phew! once i had wrapped my head around all of this, it became apparent that the easiest SMT game for me to get into was soul hackers, even though it’s technically not in the main series. the english-language version, available on iOS, might be a good place to start nowadays, but i found it just a bit too primitive to get into. apparently the DS entry, subtitled strange journey and released between SMTIII and SMTIV, took a step back from mechanics introduced in SMTIII and is thus also very close to the original series, so it seems like that would make for a good alternative as well. hopefully this write-up is useful to other people looking to get into the series. my next post will finally get to the punchline and will include my thoughts on soul hackers, so stay tuned. my ears seem to perk up whenever i hear about a game that seems to polarize players, because that usually indicates that a game has taken some sort of risk. one that i played a fair amount recently was etrian odyssey by atlus for DS. this review at gamezone.com has a fairly detailed rundown of the game’s setup, but basically the game uses the tried-and-true, typical classic turn-based RPG battle system paired with a unique gimmick which is that you can make maps of the dungeons yourself using the in-game mapping system. the DS’s touchscreen makes this an intuitive, entertaining, and new experience, but the novelty quickly wears off as you slog through floor after floor of the entirely story-less quest (although apparently a semblance of a story does get incorporated about a third of the way through the game). the game is often cited as being quite difficult, but my main problem with the game wasn’t the challenge. i don’t mind a challenge in general, although i agree that the game starts off being quite “difficult” in that you’ll have to return to the town to heal often at the beginning and you’ll be short of cash more often than not. but a few floors in, the difficulty evens out a lot and the “challenge” such as it is lessens considerably. 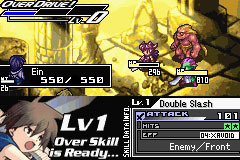 the game also seems to get praised by reviewers for its “deliberate” pacing: the game only enables you to obtain better weapons, armor, items, or accessories after you reach a certain floor of the dungeon, and the gains you receive are palpable and really feel like upgrades, as opposed to all the filler equipment you find in other RPGs. my main problem with the game is that, as with most RPGs, 90% of your time playing the game will be in battles and the battle mechanics themselves are just too dull to maintain your interest. as i’ve said before, there are only so many times a person wants to cast “fire 2” and “cure all” in one lifetime, and i’ve passed that point quite a while ago. the game did keep my interest for a while with its other key feature which is the character customization, where for every level up you’re given one skill point to allocate as you choose among your character’s class’s available skills. although this gives a definite sense of decision making, i found that it didn’t feel like enough of a unique feature to offset the fact that the majority of the classes and their skills are ones we’ve seen countless other times (fighter, check; white mage, check; black mage, check; geomancer, check). without a unique battle mechanic, story, characters, or even unique enemies or graphics (which are clean but minimal) to make up for it, exploring the dungeon just becomes repetitive once the gimmick of map-making wears off. and to top it all off, you can only warp into the labyrinth every 5 floors, so for 4 out of every 5 floors you play through you have to go through the same route over and over again fighting the same enemies to get to new areas. although i played it obsessively for the first few floors, by the time i got to the 7th floor i felt like i had seen everything the game had to offer, so although i don’t usually do so i’ve decided to set the game aside indefinitely. it seems the second game is more of the same with a few new classes, but i’ve heard better things about the third iteration which features completely new and more-unique classes and some sailing mechanics to provide some variety. i’ll probably give that one a try at some point, but i don’t think it’ll be anytime soon. – fansite with interactive maps. also includes the comics and much more easily downloadable access to the wallpapers featuring all the character portraits found on the official site. 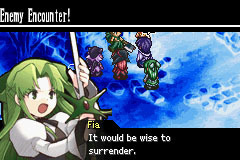 i’m always on the lookout for games that have a reputation for being a bit offbeat, and somehow i’d heard about the GBA RPG riviera: the promised land which has been remade for the PSP and incidentally is the current together retro game club pick over at racketboy.com. i don’t remember where i first heard about this game, but i’m guessing it was from reading about one of its successors knights in the nightmare, on DS, which has an equally strange premise. that game mashes up a “bullet-hell” shooter with an RPG, while this one has an oddly streamlined approach to battles, inventory, and exploration. this entry at gamespite goes into the game’s unique mechanics in detail and is a good introduction to what the game is about. i agree with that writer’s assessment that the game’s battle + inventory system is “taut”, and that practice mode (i.e. unlimited level grinding with no penalties) completely destroys any of the balance the game might have had. the natural question that follows is: how does the game hold up when you completely ignore practice mode? unfortunately, there are a lot of problems with just plowing through the game without level grinding, and my opinion based on my single playthrough is that i don’t think they’d be easily surmounted even on multiple playthroughs. one problem is that when you don’t train outside of battles it’s difficult to score well on them (each one is graded), and as a consequence you’ll earn a smaller number of trigger points (i.e. outside-battle actions) and equipment, making it harder to gain more equipment and score well on the next battle, which means you’ll continue to have a smaller number of trigger points, and so on … it’s a vicious cycle. if you stay afloat then you probably can survive this pretty well, but if you start going under you can easily get trapped in a whirlpool of low-scoring battles with no new equipment in sight. also, one thing that annoyed me about this game and annoys me about others like it (such as the gamecube RPG baten kaitos), is when you have a certain number of possible characters to use but you can only take some fraction of them into battle. in this game you have four supporting characters (all female) but you can only use two at one time, so as usual i ended up completely ignoring some people, in this case, cierra and to a lesser extent serene. this annoyance is complicated by the fact that the majority of equipment is at worst only usable by certain people in your party, so if you’re going the no-practice-rounds route then, due to the random nature of equipment found in treasure chests you’ll often wind up with equipment that’s only usable or much more optimally used by people you’ve been ignoring. there just aren’t enough battles to make it possible to train up all four of the supporting characters, so this gets to be a significant problem in the later chapters of the game. also, due to the random nature of what equipment you acquire and when, in the no-train mode just as you’ve finished mastering a weapon (unlocking its best moves) it’ll break with no replacement available for the rest of the game. frustrating, to say the least. i’m not a fan of what little i’ve experienced of dating sims in general: they always seem faintly misogynistic to me, although it’s probably because only the male-centric and none of the female-centered dating sims make it to the US. but in any case, fortunately in this game those parts are fairly minimal (although there are two gratuitous “bathing” scenes). it’s also annoying that all the extras, like an in-game soundtrack archive and a record of high scores, are only accessible if you come across certain in-game items. battles themselves are a mixed bag. i really liked that all the battles are self-contained and you don’t have to heal your party after you finish each one, and i like how the game takes a final fantasy tactics-esque approach to levelling up in that skills (and stats) are gained after using certain weapons. the super skills are fun and flashy, although the game’s apparent emphasis on keeping the enemies’ super skill meter level down (theoretically forcing you to better balance offensive and defensive moves) is oftentimes fairly pointless since a few rounds of strong offense and healing after the enemies’ counterattack pummelling will usually win you the battle anyway. it’s also annoying that you don’t actually get to see what the enemy movesets are until they execute them, and that instead the game just offers a couple of sentences for suggested “tactics” before each battle. and while i appreciate the ability to replay lost battles with a built-in handicap, it would’ve been great if you could manually select to use the handicap or not as using it lowers the highest possible score you can get for that battle. it’s also annoying that you can’t combine items of the same type, especially when one of them has only a few uses left. and also, why isn’t anyone else complaining about how incredibly small the font of this game is? i know i can’t be the only one who found myself constantly straining to read the text. finally, a non-sequel. finally sat down and finished up the first trauma center game (sub-titled “under the knife“), for DS. there was a lot i enjoyed about the game. i’m not particularly fond of the sight of blood, even in a video game, but the touch-screen controls are intuitive, fun, and work very well. the game’s problems are fairly well known. first off, by its nature the surgical procedures can get repetitive (e.g. removing tumors), but it’s definitely true that the more you do them the more you’ll master them, and the game’s ranking system does motivate you somewhat to polish your skeelz. a similar kind of game, cooking mama, was way more repetitive, and i wasn’t too bothered by it in this game. another common complaint is that the game is a bit short, and the entire last section (as well as the bonus missions) are all retreads of the same 7 procedures but in harder versions. i wasn’t so keen on that, but i was in the mood for a short game so that didn’t bother me too much either. the main complaint, though, and one that i agree with to some extent is the variable difficulty. for the most part i was making good progress, until i hit a brick wall with one of the final surgeries that i literally spent hours on. there’s a fair amount of trial and error involved in the game in general, but even aside from that some of the stages’ difficulty levels are just ridiculous. i did finally finish the game, but i had absolutely no motivation to tackle the expert missions. i don’t have much interest in getting S-ranks either (yet another case of a game having a pointless “perfection” mode), but i’m sure there are OCD fans who have revelled in those challenges. the story, characters, and graphics are fine overall, and although they were better than i thought they would be and fit the gameplay they weren’t particularly outstanding, and the music is good in general, although more variety would have been nice. all in all, definitely an enjoyable DS game, but one that i can easily see as having been bettered by its sequels. i’d already played a bit of the wii-make/expansion before playing the DS version, so i suppose i should go back and finish that before continuing on, despite the vast majority of it being the same. not expecting too much from that version, but if they made the difficulty more reasonable i should be pretty content, given the solid gameplay.